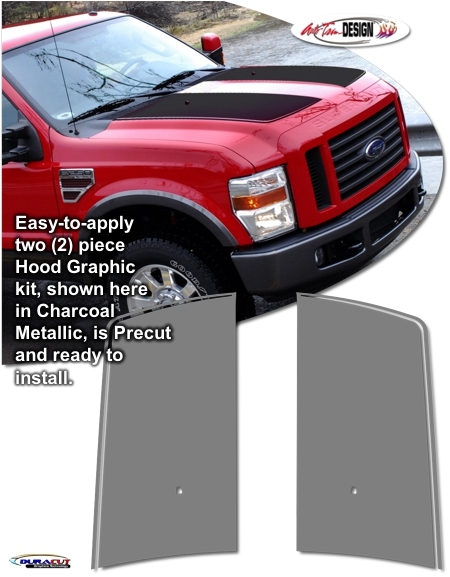 Make your '08-'10 Ford Super Duty "Tough-looking" with this awesome Hood Graphics kit. This graphic package is not just a set of straight strips in a box. Kit consists of prefitted and contoured pieces as shown in the illustration. This kit is specifically made for the '08-'10 Ford Super Duty factory hood and will not fit any other vehicle. Hood pieces are designed to be placed on the distinct upper areas of the Super Duty’s factory Hood. Dry-fitting is suggested to become familiar with proper placement.